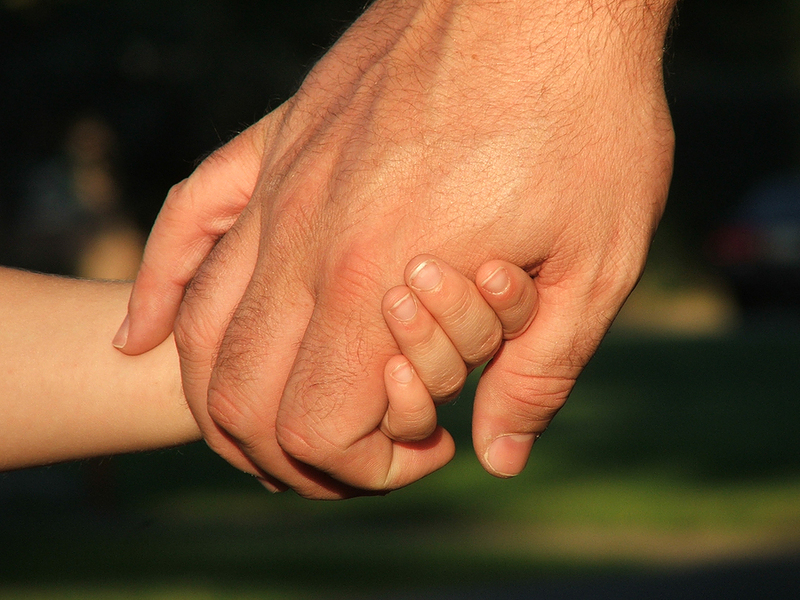 Looking for humorous quotes about fathers? 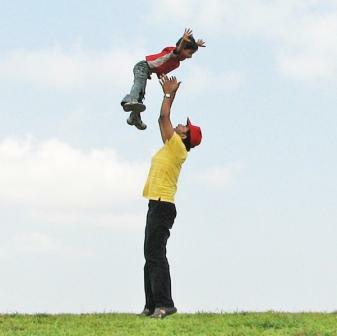 Here are some funny fathers day quotes. These quotes reflect the subtle wit with a touch of satire. Sir Walter, being strangely surprised and put out of his countenance at so great a table, gives his son a damned blow over the face. His son, as rude as he was, would not strike his father, but strikes over the face the gentleman that sat next to him and said, "Box about: twill come to my father anon." But glad in his heart that his own rejoice. Our Dads & Grads promotion is here! Save 10% on Personalized Jewelry Boxes, Travel Jewelry Cases and Watch Boxes with promo code dadsgrads in the month of June. Select leather jewelry boxes, travel cases and watch boxes can be personalized with initials or a name. 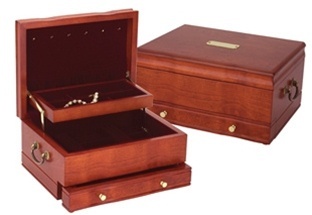 All of our wooden jewelry boxes and watch boxes can be personalized by adding an engraved name plate, just $16.95! Specify your choice of three initials, a monogram, or a message up to 23 letters. Choose script or block font. 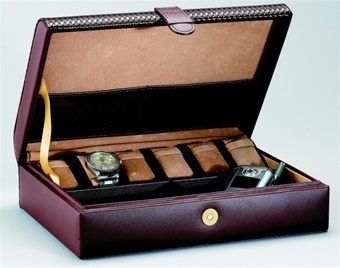 Both leather or wooden jewelry boxes, travel cases and watch boxes make perfect Father's Day or Graduation gifts. Both occasions create memorable moments and call for gifts that will be remembered and treasured. Including personalization on your gift adds a lasting touch. Use our promotion this month to create an heirloom gift! If you are looking for thoughtful and practical gifts for the men in your life, for Father's Day, graduations or weddings, then you should consider getting a men's watch box. These boxes hold more than watches as they organize jewelry, watches, keys, coins, cuff links, glasses and personal electronics in style. A description of some of the most popular men's watch boxes will give you an idea of the range of possibilities that you can choose from. If your special man is a serious watch collector, then the 12 watch luxury maple collector's box by RaGar is a gift to consider. The fine maple wood grain of this box will fit with any decor, and the 12 pillows for watches of all sizes will allow a watch enthusiast to store and display his watches in one place. The box is made by RaGar, a leading manufacturer in the field of luxury giftware and is available for $248.00. If the "Dad" in your life is a watch collector, then this is the perfect gift for him. If your gift recipient is keen to display his watches for others to admire, then an excellent choice would be the burl wood oak multiple watch jewelry box with a glass viewing top. 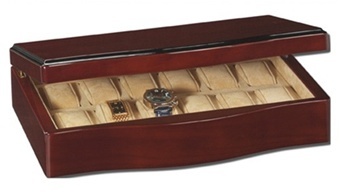 This box, made by the Mele Jewelry Box Company, holds 10 watches, five in the upper part under the display panel and five more in a sliding drawer. It lists at $105 and its discount special price of $79.95 makes it an exceptional value for your gift giving needs. 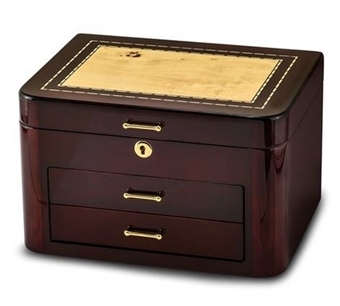 For the modern young graduates on your gift list you might also want to try a men's black java wood charging valet and electronics station jewelry box. As the name indicates, this box provides storage and a charging station for electronic devices such as cell phones, Blackberrys or Ipods. 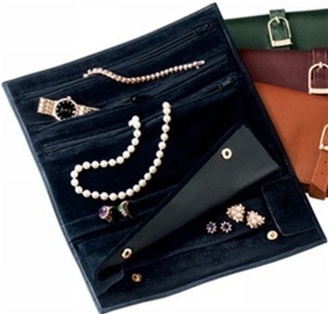 It holds three electronic devices as well as jewelry and accessories in a pull-out drawer with ring rolls. The power cords are fed through the back and hidden in a bottom compartment. It is definitely a handsome way for graduates to stay organized and with a list price of $100 and a sale price of $69.95 it will allow you to stay within a popular gift giving budget. 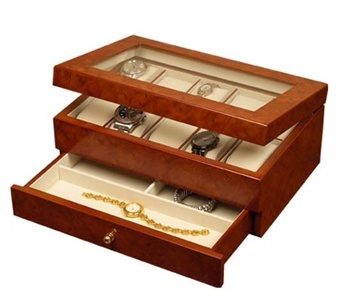 As an alternative to wood, you can also opt for a leather watch and jewelry box. 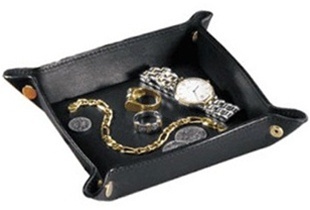 RaGar offers a handsome fine leather box with six watch pillows and a storage compartment for cuff links, a cell phone and other jewelry and accessories. It meausres 11 x 8 1/4 x 3 1/4 and would be a classy addition to any man's dresser top. With a list price of $145 and a sale price of $119.95, it would make the perfect gift for any man who is particular about his watches and accessories. 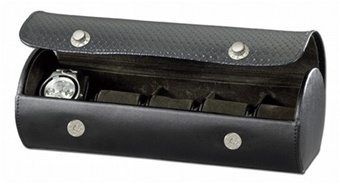 If you are giving a gift for a frequent traveler, then you might want to select a black leather five-watch travel jewelry case. This is another RaGar product and it features fine leather in black or brown with 10 4 3/8 x 3 1/2 dimensions that fit easily into any suitcase. It has five watch pillows, a snap closure and is generously sized to cushion and protect up to five watches. Its $79.95 sale price makes it an attractive gift item, for Father's Day, graduation gifts or wedding and anniversary celebrations. These are but some of the men's watch boxes that you can choose from when selecting your Father's Day, graduation and wedding gifts for men. Click on the pictures of each featured watch box to view the images larger along with the full description and details for each gift idea. If you like these gift ideas, use the facebook "like" button and share them on facebook.